A tower defence game with a twist, again! Sister game to Spira Defence. You must defend your base from enemy attack by building / upgrading defence towers. Money is awarded for kills to spend on upgrades. Interest earned. Money (bounty) is awarded for kills and interest is earned on the money left in the bank at the end of a level. Money can be used to upgrade the towers in various ways. To sell a selected tower, click the sell button, then confirm. Current interest rate and bank balance are shown under the score in the top left of the screen. Current level and lives left are shown in the top right. Chain - Average cost and range, but with high damage per hit. The damage continues to nearby enemies. The number of enemies affected can be improved. 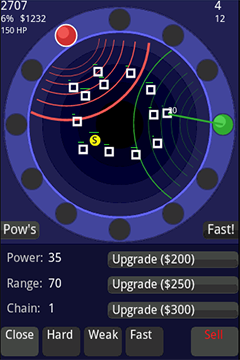 Slower - Expensive and slow, but have the property of slowing 3 enemies to make them easier targets for other towers. Their slowing effect can be improved. Reaper - Expensive, very slow, but inflicts the most damage in a single hit. If this tower is the cause of an enemy's death, there is a chance that its life may be claimed and added to your own. This chance can be improved. A special enemy that releases a power is available every 2nd level (except where bonuses are available - see Bonuses). 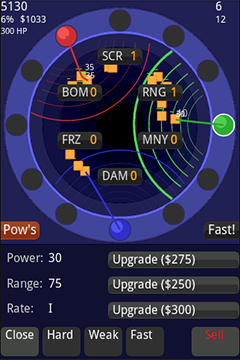 To use a collected power, select the corresponding power buton along the bottom of the play screen. Only one power may be active and will only last the duration of the current level. SCR (Score) - The score from enemies is increased. A special enemy that releases a bonus is available every 8th level. The bonus is awarded automatically. Reward - Receive a score and money bonus. Interest - Interest rate is increased. Lives - Gain extra lives. Additionally, extra lives are awarded at 50,000 points, 100,000 points and every addition 100,000 points scored. 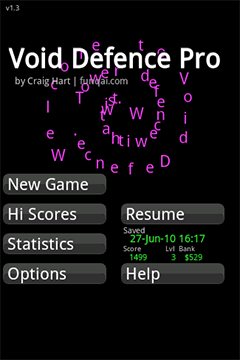 I believe there is an option to uninstall in Settings > Applications > Manage Applications > Void Defence. If that doesn't work, try restarting the phone and trying again.